Celebrate Christmas Eve with Clara at her family’s grand celebration at the Stahlbaum manor. Herr Drosselmeyer amazes the children with his magical inventions, a life-size doll and bear, which seemingly come to life. Then dream with Clara as her courageous Nutcracker Prince and his toy soldiers boldly battle the villainous Mouse King and his army of mice. 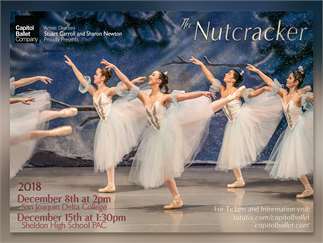 Victorious in battle, Clara’s Nutcracker becomes a handsome prince and leads her away on a magical journey. Travel with them as they pass through the beautiful land of snow and on to the Kingdom of Sweets, where they are welcomed by the Sugar Plum Fairy and delighted by dances performed in their honor, including the Waltz of the Flowers and the Dance of the Sugar Plum Fairy and her Cavalier.